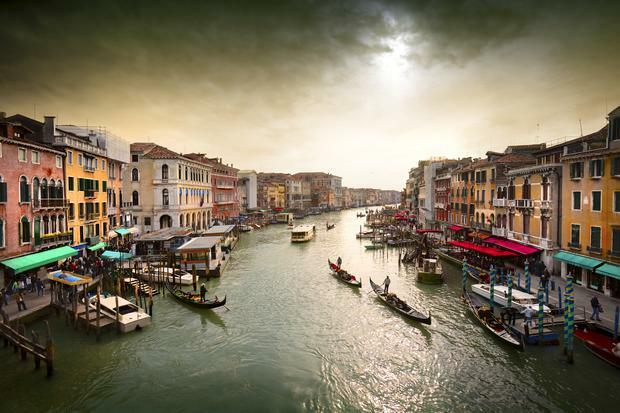 Boats and gondolas on the Grand Canal, Venice, Italy. With peak summer holiday in full swing, European hotspots are struggling with tourism hordes. Here are six of the main pinch-points. Relations between residents and the growing number of visitors to the Italian city are becoming increasingly fraught, with protests taking place and authorities banning new accommodation from opening up in the historic centre. Last month anti-tourist campaigners in the Spanish city attacked an open-top bus tour, slashing its tyres and daubing graffiti on its sides. The crux of the issue is similar to that of Venice, in that hordes of cruise passengers are let loose in the city each day. More: Is it time for cities to introduce a tourism congestion charge? Tourist boom: Sunbathers on Playa de Palma beach in Majorca, Spain. Palma, the Spanish island's capital, has been contending with the same issues as above, as well as pressure on local housing due to the growing share of holiday accommodation. Meanwhile Magaluf has spent the last few years attempting to clean up its image and attract a more refined clientele to the once-party town. Dubrovnik will drastically cut the number of visitors allowed into its ancient centre in just two years, the mayor has revealed. The new limit, designed to prevent ruinous overcrowding, will go further than Unesco’s recommendation of permitting only 8,000 people a day inside the hefty Medieval walls. Instead, a cap will be put at 4,000. An anti-tourism march is planned for later in the month, to coincide with Semana Grande, a celebration of Basque culture. The criticisms are that models of mass tourism impoverish working class people. Not quite in the same scale as the aforementioned but there are concerns that over-development and increased tourism could have a detrimental impact on the delicate cultural and ecological balance in the Himalayan kingdom.